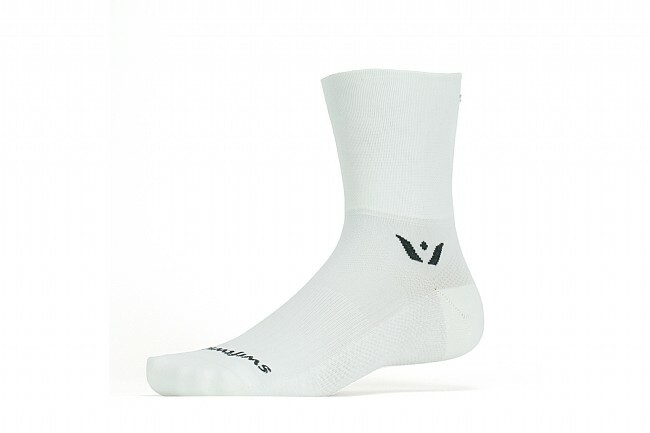 Swiftwick's original light compression sock, the Performance Four is still the standard for holding up to high-intensity abuse and keeping you comfortable day-in, day-out in all your performance pursuits. 3 Arch support relieves hot spots while nylon toe and heel protect the highest-wear areas. 4” cuff. Black or white. Medium fits men's 6-9.5 or Euro 39-42. Large fits men's 10-13 or Euro 43-46. Great socks for a great price. I will buy these again. These socks feel and look great, and they last a long time. I really like this sock. It comes in different heights and colors, and is compressive around the ankle. All Swiftwick socks are long wearing. These have a bit more paddingthickness under the foot that the Aspire model which I prefer, but the Aspire is very good also. I wear the Merino model in cold weather , They are warm and thin enough to fit in my shoes. Best socks ever. Really supports the ankle well and you forget you are wearing socks. I like the compression.